Thailand has long been one of the most popular Asian destinations for tourists from around the world, no doubt due to its beautiful countryside, friendly citizens and lovely beaches. While the country of Thailand is renowned for its open spaces and beautiful scenery, it is known for its bustling city life as well. The sprawling city of Bangkok is a riot of sights and sounds, with fast moving traffic, large international hotels, the best shops and gleaming office buildings. The modern world is very much on display here, and the country of Thailand is a growing economic force on the horizon. Budget minded tourists have known about Thailand for years, and this great vacation destination is one of the most inexpensive hot spots on the globe. While the cities can be expensive, budget travelers can easily trim those costs by staying outside the city centers and exploring the countryside. There are many wonderful villages to explore throughout the country, and the low cost only makes the country more charming and beautiful. American and European visitors generally find that their money goes much further in Thailand than in other Asian countries, making it possible to enjoy a long and leisurely vacation at a very affordable cost. Those wary of carrying large amounts of cash will find ATMs scattered throughout the country. These modern conveniences are particularly widespread in the major cities and resort areas, but they are available in smaller towns and villages as well. Credit cards are widely accepted in the large cities, at the country’s many shopping malls and at large hotel chains. On the other hand most family run lodgings and many restaurants do not take plastic, so visitors should be sure to keep enough cash on hand. Visitors should exchange most of their money for the local currency at one of the official money exchange centers, but it is a good idea to retain some U.S. or European currency for emergencies. Thailand is a land of many delights, but bad weather can ruin even the most delightful vacation. 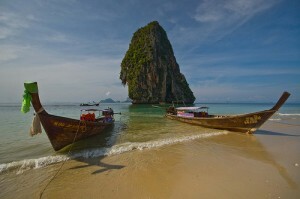 Most people find that the best time for a visit to Thailand is between November and February. During this time of year there is less rainfall, and less of the oppressive heat that often accompanies a Thai summer. The peak tourist season runs from November to the end of March, so visitors going at that time should expect large crowds and long lines at major tourist sites. Tourist traffic is also high in the months of July and August, but not as bad as the November to March peak season. Those who want to avoid crowds and enjoy lower prices may want to schedule their visits for April, May or June, when the lines are shorter and the sites are less crowded. Most major airlines have regular flights in and out of Bangkok, so getting to Thailand should not be a problem. . There are many discounters offering steeply reduced tickets, but it is important to deal only with reputable firms. Paying by credit card is always a good idea when booking travel, since this type of payment offers a wealth of consumer protections not available with other forms of payment. Many tour operators offer all inclusive packages to Thailand, including airfare, hotel accommodations, travel within the country and even sightseeing excursions. These package deals can be a good way to see the country, but independent minded travelers may be able to lower their cost by planning their own itineraries. Once they have arrived, visitors have a wealth of choices for how to get around. Many adventurous travelers choose to see the country by bike, and this can indeed be a good way to get around. Visitors who want to bring their own bikes into the country are free to do so, but the bikes must be registered with the customs agency upon arrival. Failure to do so could result in a hefty duty when leaving the country. Those who choose not to bring their own transportation in the form of a bike will find a number of alternatives at their disposal. The country features an extensive system of inter-city buses, making it easy to see the countryside at leisure. Large cities like Bangkok have their own extensive public transportation systems, making it easy to see the sights and get from place to place. Public transportation is also a very affordable option, leaving visitors with plenty of spare cash to spend at the shops and restaurants throughout the country. Renting a car is generally not recommended, since the roads in Thailand can be difficult to navigate for the uninitiated. The rental process can also be cumbersome and expensive, so most visitors are advised to rely on a combination of public transportation and taxis. No matter how they get around, many visitors find the country of Thailand so enchanting that they can’t wait to return. Thailand has many repeat visitors who arrive year after year to take in the delightful sights, sounds and smells of this unique Asian travel destination.